This article about the VW Beetle and Swarovski is yet another story of how Swarovski has been used in the non-figurine / non-fashion industry, but will certainly appeal to the Beetlemania generation. Just a tad bit of history on Volkswagon, they began producing cars in Germany in 1930’s, but the bigger boom came in 1945. 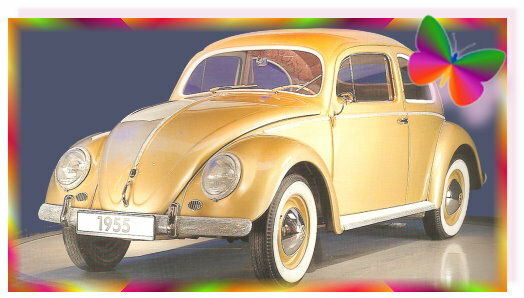 The popular economy car became better known as the “Beetle” and “Bug”. In August, 1955, the 1,000,000th Beetle came rolling off the production line. In 2000, Volkswagon had the 1,000,000 unit completely renovated for display in the Volkswagon theme park. The park, Autostadt, is in Wolfsburg Germany. The makeover features include gold paint, new brocade upholstery, and the very sparkly chrome bumpers and trim accents. Over 30,000 stones were hand-applied by Swarovski craftsman in Wattens. At that time, they probably thought it was a pretty-blinged up car. Compare it to the Swarovski Royal Wedding Mini Cooper with over 300,000 hand-set Swarovski Crystal stones!